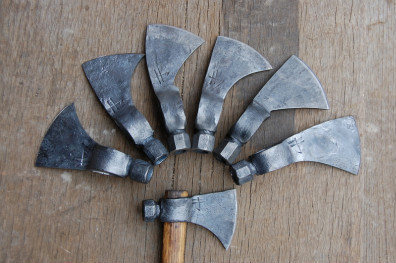 Axes are some off the oldest edged tools in human history, and surprisingly one of the most unchanged. A sharp edge, on the end of a long handle, with enough weight to carry the "bit" deep into its intended target via the momentum from the handle and the usesers arm. Be this target a piece of wood, or in the case of warfare - flesh, the axe has survived the test of time. 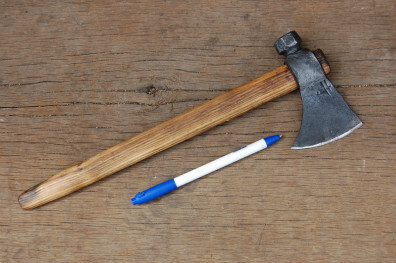 Using traditional techniques, I craft my axes through the use of fire and anvil, producing an object that any man (or woman) would be proud to carry, no matter the time period. The axe at left, is what would be termed a "camp axe" or "forest axe". fitted with a 3/4 sized handle it would of great use limbing trees, cutting fire wood, and other woods or camp chores. Wrought iron body, high carbon "steeled edge", forge welded construction. 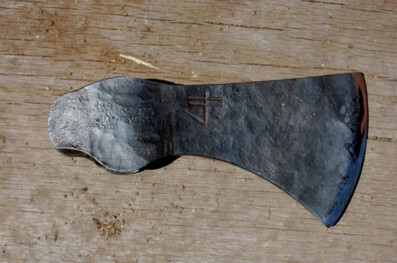 Iron tomahawks were introduced to the Native Americans by the Europians as trade items. Their use as camp tool, weapon, and even their use in games of skill made them a favorite among indians, trappers, and other frontiersman in early America. These tomahawks at left are forged from old 50cal. black powder rifle barrels. Hardened and tempered bits, teardrop shaped eyes, and at the back or "pull" is a pipe - for smaking tobacco - just like many of the originals. Tiny tomahawk of the same style as above. A great tool bridging the gap between knife and axe.